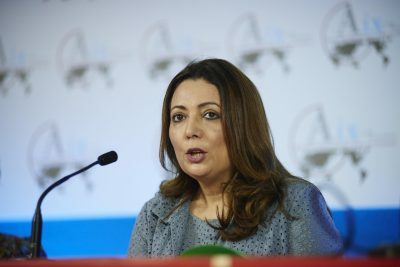 Since May 2011, she is the President of UTICA, the Tunisian Confederation of Industry, Trade and Handicrafts (Confederation of Private employers), first woman elected to this position. In 2013, under the auspices of the G8 Deauville Partnerships, she was awarded the “Best Business Woman of the Arab World” award. 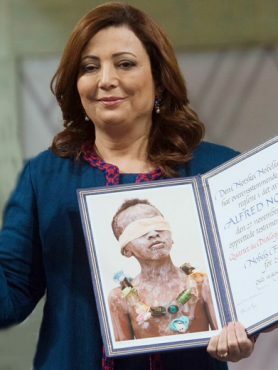 The same year, she founded “The Tunisian National Dialogue Quartet”, along with the Tunisian General Labour Union, the Tunisian Human Rights League (LTDH), and the Tunisian Order of Lawyers. The quartet initiated negotiations with all parties involved in a deep political crisis, resulting in a solution acceptable to all. It is for this initiative that she was awarded the Nobel Peace Prize in 2015. Ms Bouchamaoui has been named a “Business for Peace Honouree” in 2014. In January 2015, the Tunisian President, Mr. Beji Caid Essebsi made her Grand Officer of the Order of the Republic, and His Majesty, King Carl XVI Gustaf of Sweden, decorated her with the Royal Order of the Polar Star in November 2015. She also received in December 2015, the “Legion d’Honneur” from the French President, Mr. François Hollande. Member of the Oslo Business for Peace Award Committee since January 2016, she is identified as one of the most influential businesswomen in Africa.